I'll admit, I'm late to the game with Jodorowsky, only recently emerging myself in his filmography. And let me tell you, immersing yourself in his films is quite the odyssey. A strange, surreal odyssey and Santa Sangre, the first film he directed in 9 years after Tusk, is a slight departure from his usual fare, but not any less intriguing or fascinating to watch. Bear in mind, I went into this after just having seen The Holy Mountain, which was a tour de force of the senses; just to give you an idea of where my mindset was and what I was sort of expecting with this film. What made wanting to see this even more intriguing was having heard that it was essentially Jodorowsky's "Horror" film, something that got me really excited. So did it blow my mind? Santa Sangre left me with mixed feelings. While it's certainly an odd tale, often times visually arresting (I like these kinds of films), and one that only someone like Jodorowsky can tell, it's certainly not a horror film, not even in the unconventional sense, which, when all said and done, was a bit of a disappointment. I would call it a psychological drama with some dark surreal undertones. 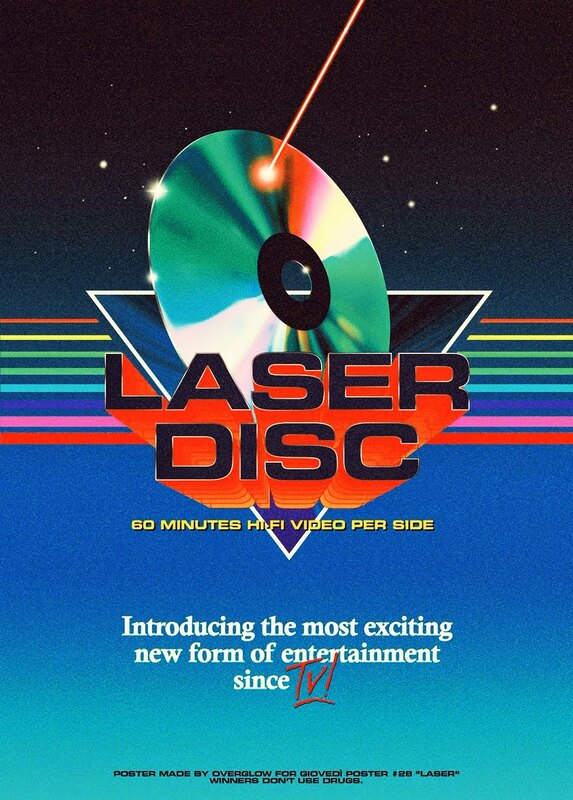 Fascinating, yes, but it didn't "wow" me the way The Holy Mountain or El Topo did. As I watched it, the excitement I had going in started to slowly wane and when it was all said and done, the overall feeling I took away from it was that Jodorowsky had slightly lost his touch, or in the least, some of his sizzle. Not to say Santa Sangre is bad, it's not. Maybe a tad on the dull side, but thankfully it's filled with enough oddball characters, nonsensical sequences (a Jodorowosky trademark), surreal imagery and religious overtones that it keeps you invested. Just not on par with his earlier work. Interestingly though, this is probably one of his most linear films. For the most part, it tells a straightforward story about a boy who grew up in the circus in a crazy environment with his even crazier mother only to grow up into adulthood with some serious psychological trauma and a severe case of mommy issues. Of course it's filled with other subplots and naturally, things that don't make sense, but you get the idea. But that's also what makes his films so unique, the experimental vibe that's acquired him such a cult following. What also makes it unique is that it's like two separate films divided down the middle where the first half deals with the circus life, and the second half dealing with Fenix's (Axel Jodorowsky) survival in the adult world after having spent some time in a mental facility. Or at least, I think that's where he was? One performance that will more than likely knock your socks off though is that of Blanca Guerra, who plays Fenix's mother. A raw, unfiltered and completely unsettling performance that will surprise you. You know, it's shame that Jodorowsky takes such huge gaps between films. While not for everyone, they are overwhelmingly original. But as I previously said, being new to the Jodorwosky experience, I'm coming off having just recently seen The Holy Mountain, and having a vague memory of watching El Topo many years ago. 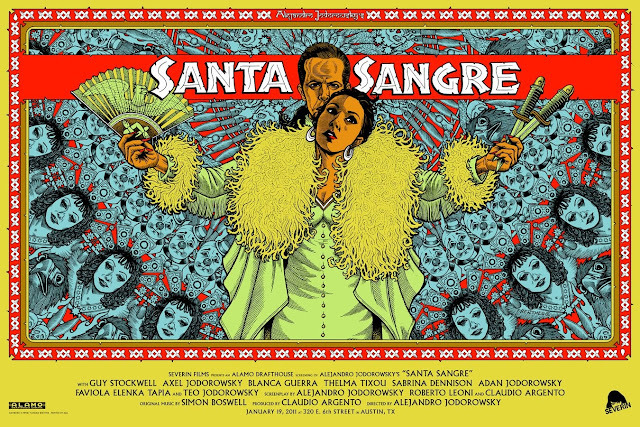 Had I seen Santa Sangre first, my opinion might be vastly different. Or it might not. I guess we'll never know. What I find most interesting I think is that when you watch any Jodorowsky film, and then watch him in interviews try to explain his films or his reasons for putting certain random things in there or what he was ultimately trying to achieve with each film are more often times than not, completely different. He seems to be living on a completely different plane of existence than about 95% of the planet, which obviously makes him quite a colorful character. An extremely talented one I might add. Then again, some might just call him a nut. Of the few films of his that I have seen, I feel that Santa Sangre takes a step back from the surreal and delves more into the fantastical. Even then, I found an unevenness to it that ultimately made it less entertaining than some of his earlier efforts and it felt incredibly drawn out a times, as if half an hour could or should have easily been cut out to help it's structure. Basically it feels like a much older Jodorowsky has matured somewhat into mainstream. Not a bad film, but not a great one either. Bizzare? Most certainly. A unique surreal film that works as both a drama and a psychological nightmare, but not as great as you hope it will be. Santa Sangre is a film you won't forget, for better or worse. A quick shout out to my buddy Dennis for lending this to me, as well as the DVD Box Set that I will soon devour. It's on! Thanks man. 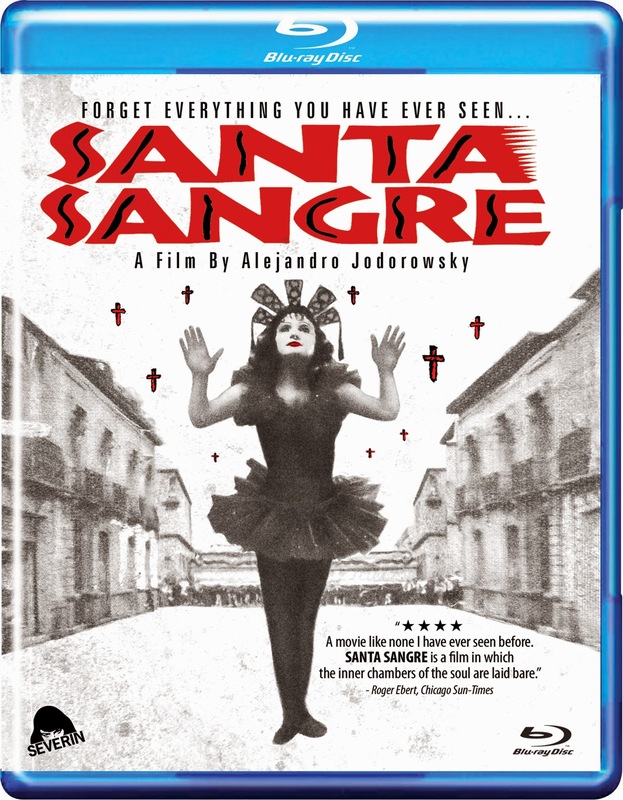 Apparently, Santa Sangre was unseen or unavailable in the U.S. for 20 years until Severin Films released a standout DVD and Blu-ray back in 2011. Finally, those die-hard Jodorowsky fans could revel in the madness of his first film in nearly 10 years. Surprisingly, it wasn't included in the 2007 DVD Box Set The Films of Alejandro Jodorowsky, considering it's one of his better known films. The specs are pretty standard with it being in 1.77:1 widescreen with Dolby Digital 5.1 sound and a running time of 124 minutes. 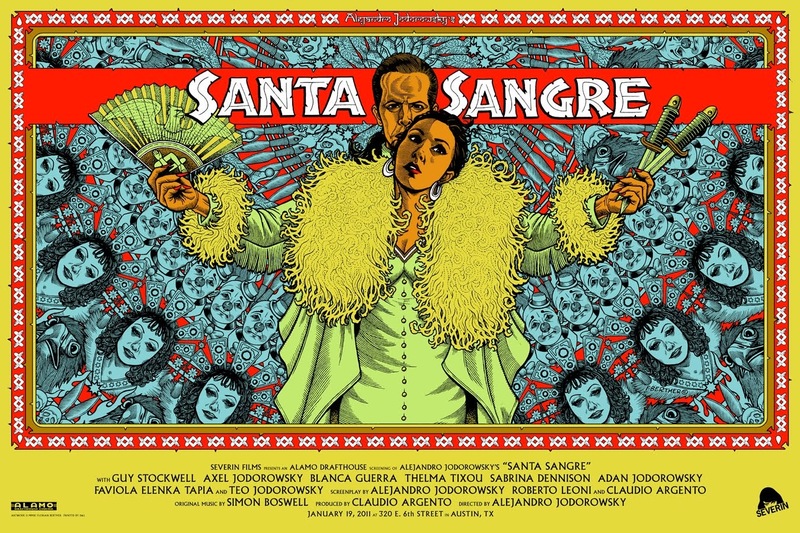 The standout of this release though is the insane amount of Special Features to delve into, and there is a lot, beginning with an in depth and multi-part Making-Of Documentary called "Forget What You Have Seen: The World of Santa Sangre". You also get multiple interviews, shorts, deletes scenes, commentary and other documentaries. If you would prefer to stream it, Netflix isn't offering it anymore, but you can rent or download it digitally at Amazon Instant Video HERE.